Members of Wallace State’s volleyball team are, front row, from left, Lexie Riggins, Maya Jones, Katie Edwards, Alex Wiggins, assistant coach Kheala Roberts, head coach Randy Daniel, manager Macy Green, Madison Turner, Courtlyn Barber and McKenzie Boland; back row, from left, Genesis Taylor, Madison Rhodes, Karlee Hale, Jordan Hollis, Kaden Edenfield, Kate Kent, Kaitlyn Doyle, Karmahn Hall, Kayla Thomas and Alexis Snow. HANCEVILLE – Wallace State volleyball has been the premier team in the Alabama Community College Conference (ACCC) for the past decade, winning nine consecutive league tournament titles. The 16th-ranked Lions begin the chapter for a 10th straight championship on Friday, opening the 2018 season at Spartanburg Methodist (South Carolina). “Each season we have different individuals prepared to win championships for us. This year’s team should be an exciting one. We have more depth than we did last year, and our freshmen have a tremendous amount of potential. I’m excited about that. 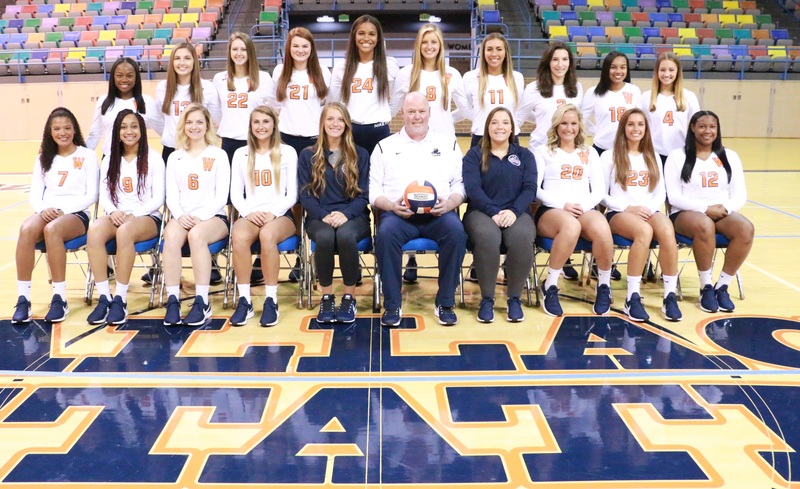 The main thing is getting experience under our belt, so we’re playing our best at the end of the season,” said Wallace State volleyball coach Randy Daniel, who’s entering his 12th season with the program. No matter the roster turnover each season, winning has been a constant for Wallace State volleyball under Daniel, who has compiled a 404-89 career record with the Lions. Wallace State has reeled off 59 consecutive wins in conference matches, an undefeated span stretching four seasons, and won 10 straight regular-season titles. Wallace State has five sophomores returning from last season’s team that went 34-10 and also made a ninth straight appearance at the NJCAA Division I national championship. Lexie Riggins, Maya Jones, Alex Wiggins, Courtlyn Barber and Katie Edwards return to the fold. Riggins, a middle hitter from Chelsea, was named the ACCC Tournament MVP last season. She was second in the conference with 393 kills and the ACCC leader with 160 blocks and a .416 hitting percentage. Jones, a middle hitter from Hoover, was also an ACCC All-Tournament selection. She finished the season with 168 kills. Wiggins, an Enterprise native, had 288 kills and 279 digs as a freshman, and Barber added 144 digs and 100 kills. Barber is from Westbrook Christian School in Rainbow City. McKenzie Boland and Madison Turner are sophomore transfers. Boland, a 5-foot-9 setter, played last season for The Citadel in South Carolina. Turner is a libero from Chelsea. “McKenzie Boland has been a great addition. Her experience is definitely going to be an asset for us,” said Daniel, the all-time winningest coach in program history. Wallace State has 10 freshmen on this season’s roster. Daniel expects Alexis Snow (libero, Danville), Karmahn Hall (libero, Bob Jones), Kaitlyn Doyle (outside hitter, Hernando, Miss. ), Madison Rhodes (setter, Helena), Jordan Hollis (opposite hitter, Providence Christian) and Karlee Hale (opposite hitter, Geraldine) to each make strong contributions this season. Freshmen Genesis Taylor (James Clemens), Kate Kent (Good Hope), Kayla Thomas (Calera) and Kaden Edenfield (Foley) round out the roster. Taylor and Thomas each play libero, Kent is a middle hitter and Edenfield an opposite hitter. Wallace State opens the season Friday in South Carolina, playing four matches over the weekend. The Lions dip into conference action immediately after that, traveling to Snead State and Coastal Alabama-South next week. Wallace State’s home conference opener is Sept. 19 vs. Southern Union. The Lions have three conference matches in a row at home on Sept. 26-28. Oct. 3 and 10 also mark home conference matches. Wallace State will host the ACCC/Region 22 Tournament on Nov. 2-4. Kheala Roberts Beck joins Wallace State’s staff as a first-year assistant. She played at Wallace State during the 2014-15 seasons, earning All-ACCC first-team recognition during her sophomore season. “Kheala is a great person to have around our program. She knows what I expect and that’s huge. She’s a great communicator and gives another person for our players to talk with,” Daniel said.